Last week we had a real honest-to-gosh Ice Storm. There were heavy tree branches down everywhere, including in my driveway. A couple of my pine trees got hit hard. The good news is, this storm just lasted overnight. 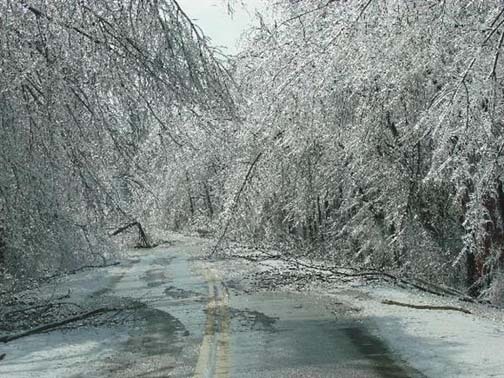 Back in 1998, the big ice storm that hit Maine lasted several days, piling ice upon ice, knocking out power lines as quickly as they were repaired. That first morning, so many branches were snapping that it sounded like gunfire. From inside the house we watched a telephone pole across the street slowly bend from the ice that was piling up on it, until it broke in two on the third day. We were without power, telephone or running water for fourteen days in the dead of winter. Our aged generator powered the heat, refrigerator and one kitchen light. It needed to be gassed up three times every day: first thing in the morning, mid-afternoon, and again just before bed. This meant daily trips to the China Store for gas. The store was a little bit of an oasis, surrounded at first by dark houses. For water to flush the toilets with, I filled buckets with snow and melted it in the basement. I spent the days chopping up the huge branch -- really a small tree all by itself -- that had dropped off one of the maples in the front yard. I had nothing but a dull axe. I suppose that I could have borrowed my brother-in-law's chainsaw, but chainsaws give me the willies. From my bedroom window at night, I could see all the people in the distance who had gotten their power back. We occupied a black spot on the landscape. We took turns being the calm, rational one and the one who had had enough and was ready for their meltdown now. Midway through the ordeal, we came to town and ate Chinese food. This was like going to heaven. On the fourteenth day, the truck finally came along. It was a crew from New Jersey. They were very nice, but they could not reconnect our original underground line and had to string a new one over the road. This meant that we also had to call in an electrician to connect the house to the new line. It was a horrible fourteen days, but once was over it became a badge to wear. There were people who had only lost their power for an hour or a day or so, which allowed me to think of them as pikers. "My Ice Storm was worse than your Ice Storm, so there!" Isn't that what hardships are for? To give you bragging rights when you come out the other side. This made me laugh AND brought a tear to my eye. It was the last of the good and bad times I had with my Daddy before he died, and I was hugely pregnant with Izzy. This piece makes me remember the camaraderie and the commiseration. Thank you for that.